LOS ANGELES, CA--(Marketwire - Oct 29, 2012) - VYCON, the designer and manufacturer of environmentally friendly, high-speed energy storage flywheel systems, today announced that its new VDC-XE with High Current (HC) option flywheel systems have been selected by the editorial board of Plant Engineering magazine as a finalist in the Energy Management category in the competitive 2012 Product of the Year award event. As an alternative to maintenance intensive lead-acid batteries used in uninterruptible power supplies (UPSs), VYCON's environmentally friendly flywheel energy storage systems use kinetic energy to provide reliable, efficient power protection. 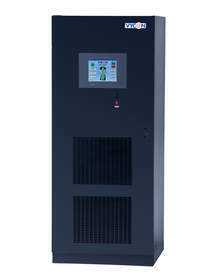 The 300kW VDC-XE with HC option is the perfect solution for protecting power dependent applications in facilities that don't have the floor space for multiple backup units. In addition, VYCON's patented flywheel technology provides users with a more reliable, cost-effective and greener approach to backup power in place of hazardous, lead-acid based batteries. Eliminating the need for costly cooling, the flywheel systems feature a reduced cost per kW, giving facility managers dependable reliability while reducing costs. In 2012, Plant Engineering's Product of the Year awards will celebrate its 25th anniversary. For a quarter-century, Plant Engineering's readers have selected outstanding new products that help them do their jobs smarter, safer, more efficiently and more productively. The full list of Finalists will appear in print in the November issue of Plant Engineering magazine and appear online on Monday, Nov. 19, at www.plantengineering.com/POY. Plant Engineering readers who have the responsibility to buy and/or specify products will receive the online ballot to vote for the 2012 Product of the Year winners. Voting begins on Monday, Nov. 19, and will end on Thursday, Jan. 31, 2013. "We're pleased to have this technology validation from the editorial board of Plant Engineering magazine," said Dann McKeraghan, vice president sales and marketing for VYCON. "Plant engineers are looking to deploy reliable, cost-effective technologies at every turn. VYCON's VDC-XE with HC option flywheel provides these advantages while also reducing energy and maintenance costs." VYCON is an innovator in the design and manufacturing of technologically advanced flywheel energy storage systems that enable a highly reliable, cost-effective and "green" energy storage solution for a variety of applications. The company's REGEN flywheel systems, used in regenerative power applications such as container cargo handling crane applications and light electric rail, reduce power and energy costs to port and rail operators, including Los Angeles County Metropolitan Transportation Authority, as well as provide a reduction in green house gasses. Key to VYCON's flywheel superiority and dependability is its ability to discharge and recharge very quickly when called upon during power outages. VYCON's fleet of VDC, VDC-XE and REGEN systems have logged a record three million-plus discharge and recharge cycles -- in very demanding applications that oftentimes call on the VYCON systems to discharge and recharge every two minutes. VYCON's flywheel systems are deployed around the globe in mission-critical operations such as data centers, hospitals, universities, broadcast studios and manufacturing plants to protect critical computing equipment. For more information on VYCON's innovative green power solutions, contact VYCON at sales@vyconenergy.com or visit VYCON's web site at: www.vyconenergy.com. VYCON is an innovator in the design and manufacturing of technologically advanced flywheel energy storage systems that enable a highly reliable, cost-effective and "Green" energy storage solution for a variety of applications. VYCON's products are applied in the power quality markets to provide back-up power in mission-critical applications and in the energy re-cycling markets for capturing and regenerating energy in crane, electric rail and distributed generation applications. VYCON is headquartered in Los Angeles, Calif.
About this company VYCON, Inc.
VYCON's VDC-XC environmentally friendly flywheel with High Current Option (HC) is a green alternative to lead-acid batteries used in UPS systems.